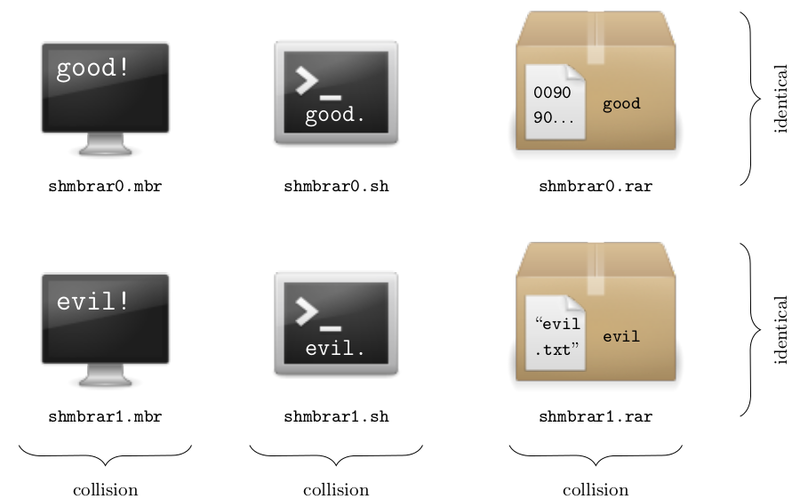 TL;DR: If the four 32-bit constants of SHA-1 can be modified, then exploitable collisions can be constructed. No need to panic, this doesn’t affect the original SHA-1. However, vendors and customers of products with custom cryptography will be interested. This is the webpage of the Malicious SHA-1 project, a research project that demonstrates how the security of the SHA-1 hashing standard can be fully compromised if one slightly tweaks some of the predefined constants in the SHA-1 algorithm. That is, we show that systems using “custom” versions of SHA-1 may include backdoors exploitable by the designers. Such custom versions of cryptographic standards are typically found in proprietary systems as a way to personalize the cryptography for a given customer, while retaining the security guarantees of the original algorithm. Implications of this research are discussed in our FAQ. More details are given below, and a full description of our work is reported in the research paper. To contact us, please use the address malicioussha1@131002.net. The security of a cryptographic hash function such as SHA-1 relies on the practical impossibility of finding collisions, that is, distinct messages having the same hash value. Denoting the hash function H, a collision is thus a pair of distinct messages M1 and M2 such that H(M1) = H(M2). 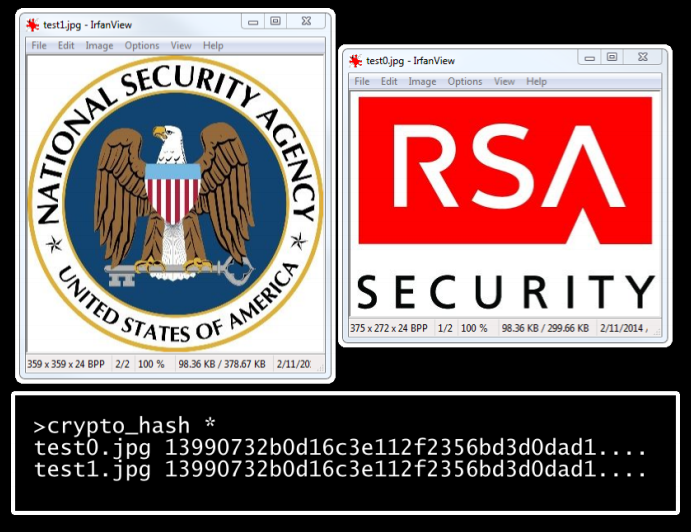 SHA-1 is a NIST standard designed by NSA in 1995 and used everywhere: in TLS, SSH, IPsec, etc. as part of encryption, signature, message authentication, or key derivation schemes. 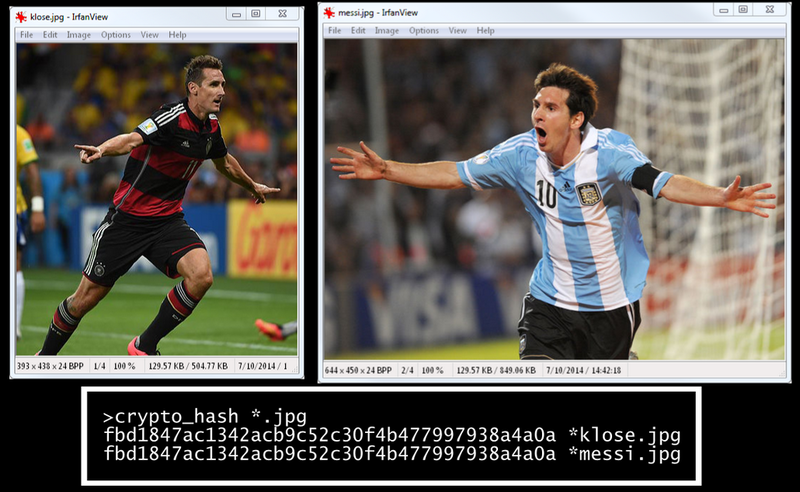 SHA-1 produces 160-bit hash values. Therefore a generic attack requires approximately 280 evaluations of SHA-1 to find a collision, as per the birthday paradox. Such a “birthday attack” works on any reasonable hash function regardless of its strength. Cryptographers thus say that a hash function is “broken” if one finds an attack substantially faster than the birthday attack. The known collision attacks are differential attacks. These introduce differences in the first message block—SHA-1 processes message by compressing iteratively blocks of 512 bits—and control the propagation of the differences thereby injected in SHA-1’s internal state in order to “correct” the disturbances thanks to a second message block and thus finally obtain a collision, thanks to an internal state now free of any difference. To find a differential characteristic, we build on previous research and sought a characteristic by linearization that minimizes the cost of construction a malicious version of SHA-1. The SHA-1 constants modified are the 32-bit values K1, K2, K3, and K4, which are injected in steps 1-20, 21-40, 41-60, and 61-80, respectively. The arithmetic operations of SHA-1 are not modified, and the malicious versions are as strong as the original SHA-1 (unless, obviously, one knows the backdoor, which is at least as hard to retrieve as to break SHA-1). The exact number of differences in the constant varies with the malicious SHA-1 constructed, and on average is 40 bits of the 128-bit constants. Contrary to theoretical attacks on the original SHA-1, our method find collisions between two 1-block messages, rather than 2-block messages. The constraints prevent us from finding colliding binaries for the common operating systems: PE (Windows), ELF (Linux), Mach-O (Mac). Fortunately, some other formats are more flexible. Note that in the above shell script, we could have included any commands inside the if and else statements. We also produced colliding files of the following file formats: RAR and 7zip archives (requiring a 4-byte signature, however this doesn’t need be at offset 0) and Master Boot Records and COM executables (which don’t require a signature and can directly start with actual code). What are the implications for SHA-1’s security? The differential cryptanalysis techniques used to find our collisions are inspired and derived from the best known attacks on the original SHA-1, and do not lead to improved attacks on SHA-1 (as far as we can tell). 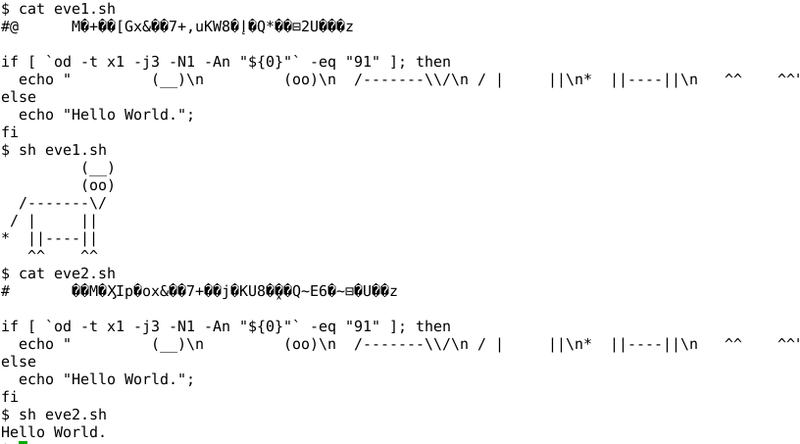 Did NSA use this trick when creating SHA-1 in 1995? The original SHA-1 constants are “nothing-up-my-sleeve-numbers“, derived from the binary representation of the square roots of 2, 3, 5 and 10. Choosing natural constants or other “meaningful numbers“ significantly reduces the available freedom and leaves little room for adjustment in an attack. However, this does not completely eliminate the possibility of backdoors, since there are several other ingredients in the algorithm to fiddle around with for more entropy: choice and structure of operations (SHA-1 features different binary functions in different rounds), rotation values, etc. How are the modified constants weaker? 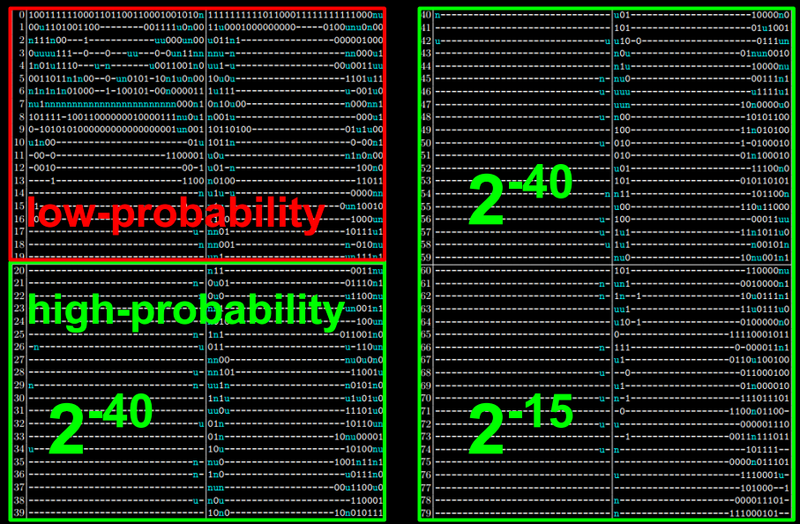 Unlike operational parameters such as rotation values, the exact values of the round constants we modify do not have a direct impact on the security of the hash function (although there are some values that would weaken the algorithm by introducing undesirable statistical properties, for example choosing all 0s). Our attack only exploits the fact that the designer has freedom in choosing the constants, not any particular weaknesses. To third party analysis, malicious SHA-1 remains as strong as the original SHA-1: the backdoor is “undiscoverable“, it can only be exploited by the designer. Can you do the same for SHA-256? SHA-256 uses 64 distinct constants for each of its 64 steps, whereas SHA-1 uses 4 distinct constants for each 20-step “round” of its 80-step construction. This provides much more freedom to sabotage the algorithm, however this will likely imply many more differences (in terms of Hamming weight) than in the case of SHA-1. Whereas theoretical attacks are known on the full, 80-step, SHA-1, the best known collision attacks on SHA-256 are on 31 steps only, of 64 steps in total. It may thus be difficult to find a 64-step characteristics exploitable to build a malicious SHA-256.